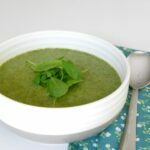 This tasty and super healthy watercress and cauliflower soup can be enjoyed by everyone as a low carb appetizer or lunch dish. Are you a fan of watercress? I think it is more popular in the UK (where I am from) than in the US – where it is also called cress. Cress in the UK is also known as Garden Cress, and the two are related, but not the same. And, as Wikipedia so helpfully informs me, watercress is also related to mustard, radish, and wasabi. These vegetables work really well in our family, because I like spicy food but my husband doesn’t like hot peppers. But he *does* like mustard-style heat. So it was a bit of a surprise to discover that this was the first *mention* of watercress on the blog! I particularly love it as a tangy salad ingredient, used in a similar way to arugula. 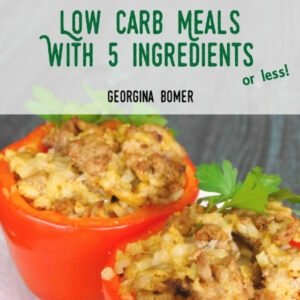 It’s made up of 95% water, and is super low in carbs (yay!) – 1 cup of chopped watercress (about 34g) contains only 0.2g net carbs!! By adding it to a soup with cauliflower, it helps keeps the carbs down but provides a lot of goodness (particularly vitamin K) and a little bit of peppery heat. 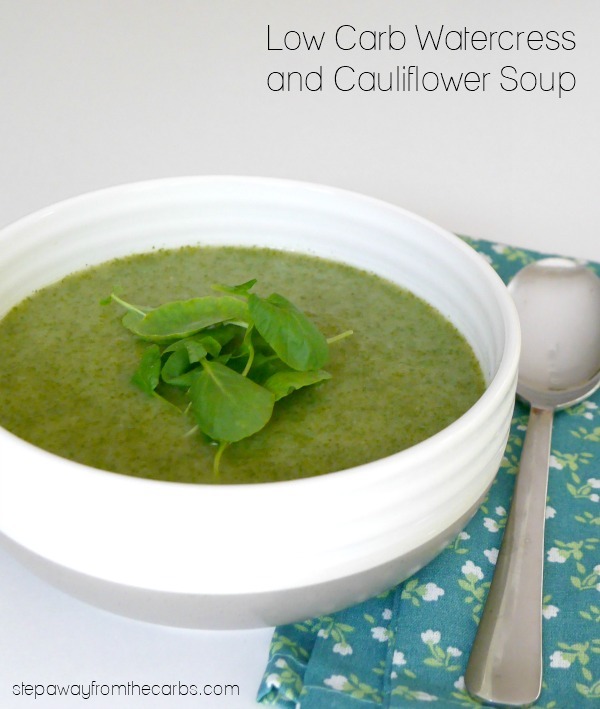 To make this delicious soup, add a bag of frozen cauliflower, vegetable stock, and fresh watercress to large saucepan. Bring everything to a boil, then reduce it to a simmer. Cover and continue at a simmer for 15 minutes or until the cauliflower is tender. Carefully transfer everything to a blender (I love my Ninja!!) and blitz until smooth. Pour the soup back into the saucepan and taste for seasoning – add salt and pepper as necessary (I usually find that I need quite a bit with a homemade veggie soup, but a lot depends on the vegetable stock that is used). Serve, garnished with a little extra watercress, if you like. 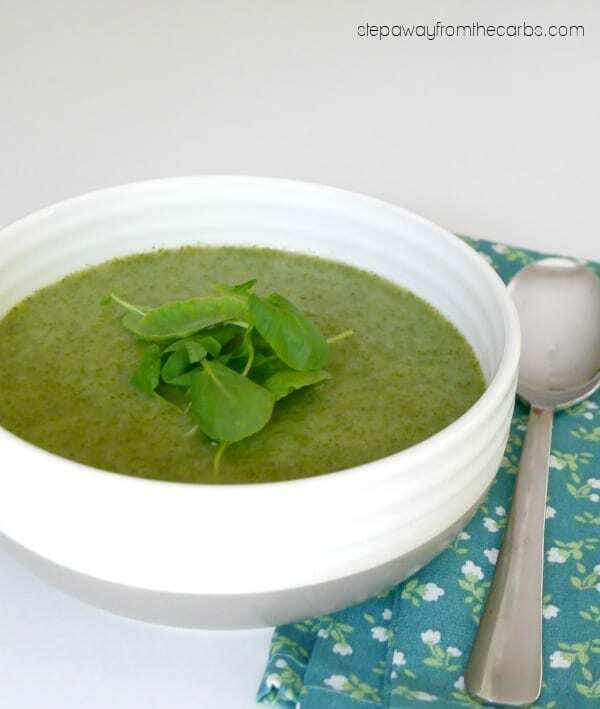 This watercress and cauliflower soup serves four as a healthy appetizer. As a lunch dish it serves 2-3. Add the cauliflower, vegetable stock, and fresh watercress to a large saucepan and bring it to a boil. Reduce it to a simmer, then cover and continue at a simmer for 15 minutes or until the cauliflower is tender. Carefully transfer everything to a blender and blitz until smooth. Pour the soup back into the saucepan and taste for seasoning - add salt and pepper as necessary. Serve, garnished with a little extra watercress.